If you haven’t driven down Avocado Road lately then you may have missed it, but you’ll want to make a detour on either Tuesdays or Saturdays to get fresh vegetables and flowers at great prices. 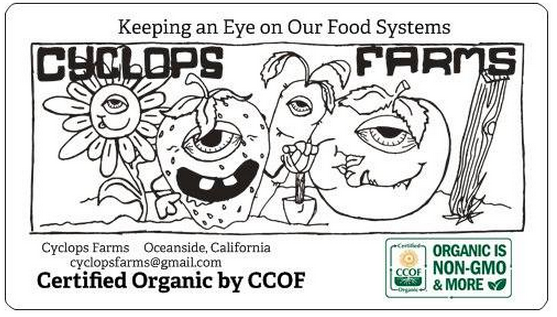 Cyclops Farms, a family owned and run CCOF certified organic farm, broke ground at 1448 Avocado Road in February and is serving up flowers and vegetables to residents and local markets and restaurants like Cream of the Crop and The Privateer. Founder, Luke Girling, attended Oceanside High, graduated from The Center for Agroecology and Sustainable Food Systems farming program at The University of Santa Cruz in 2013 and has been the farm manager for the farm to table experience at West Steakhouse and Bistro West for the last two years. He, his wife, and two young children started farming their own yard in south Oceanside and launched a Kickstarter campaign to help raise what they needed to fund the expanded location on Fire Mountain. There’s a great video from the Kickstarter campaign that tells all about the project on the Osider web site – be sure to check it out here. Fire Mountain prides itself on riding that line between urban and rural and Cyclops Farms is a perfect addition to that vibe – taking what was once an empty yard that kept residents guessing what might happen to it, they created something that residents can be a part of and benefit from. The farm to table operation will be growing certified organic seasonal veggies and they anticipate that some of the out-of-the-ordinary items they offer will inspire people to cook creatively. When you talk to Luke, his passion for healthy food shows and his excitement about the farm and the community will make you just as excited to eat healthy veggies and support this business. When we stopped by the farm they had tons of different types of peppers (from mild to hot) as well as tasty tomatoes, three kinds of squash and fresh, pretty flowers. They plan to have pumpkins available starting this weekend and you can bring the kids and pick out your own. Support your local farmer by bringing home healthy, safe foods! Categories: Fire Mountain Development, Plants and Garden | Tags: Business, Farm to Table, Fresh Vegetables, Grocery, Market, oceanside | Permalink. There are two proposals before the Planning Commission on Monday requesting permission to construct to the maximum allowable, adding to the already increasing density of Fire Mountain. We have another opportunity to declare our neighborhood off limits to increased density and open to sensible development. Please attend the Monday night (May 24th) Planning Commission hearing to support reasonable development in our neighborhood. At issue here is the continued recommendation by the Planning Staff of increased density in our Neighborhood. The current Zoning is R-1/acre. That means 1 home per acre, with an allowable zoning of 1-3.5 with a conditional use permit. The Planning Commission recently denied an applicant on Avocado on the same type of request by a 5-2 vote. The City Council then approved it over neighborhood protest. We have to stop this density maximization. We can see the results of the City Council vision at the corner of Fire Mountain and Yucca. This is your chance to help preserve the quality of our Neighborhood. Best results are when you attend the Planning Commission meeting AND send an email in support of your opinion. If you cannot make the meeting, it is important that you contact your Planning Commissioners and let them know you oppose density increases before the meeting. This information is provided by individuals and does not represent the opinions of any organization. 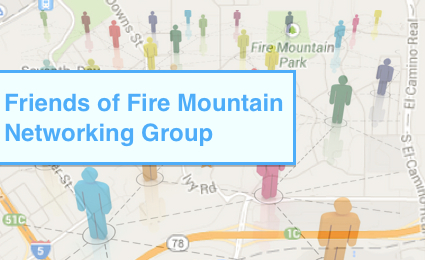 Categories: Fire Mountain Development, Meetings and Events | Permalink. THURSDAY, APRIL 29, 2010 AT 12:04 A.M.
Fire Mountain is Funky. Eclectic. Upscale. Rural. Yep, and we’ll claim it. Categories: Fire Mountain Development, History, News, Uncategorized | Permalink. It’s a pretty location, but it’s a tired-looking campus. After nearly half a century, the place is overdue for a makeover. According to the report the school is getting a $24 Million dollar renovation. Cove Canyon Bluff Subdivision: New projects submitted on Fire Mountain are posted to this web site for your consideration. The public review period for the Cove-Canyon Bluff Subdivision has not been stated.